Sugar occurs naturally in vegetables and fruits, as well as in some whole grains and dairy products. Naturally occurring sugars provide a healthy alternative to foods with added sugars, such as cakes, pastries, processed foods and refined breads and cereals. Fruits and vegetables have naturally low calorie and fat content and provide many important nutrients. Most vegetables contain some sugar. One serving of cucumber, green onions, leaf lettuce or potato contains 1 gram of sugar, according to the U.S. Food and Drug Administration. One serving of asparagus, broccoli, cauliflower, celery, green snap beans, iceberg lettuce, radishes or summer squash contains 2 grams of sugar. One serving of green cabbage or tomato contains 3 grams of sugar, a serving of bell pepper contains 4 grams of sugar and a serving of carrots or sweet corn contains 5 grams of sugar. One serving of sweet potato contains 7 grams of sugar, and one serving of onion contains 9 grams of sugar, according to the FDA. 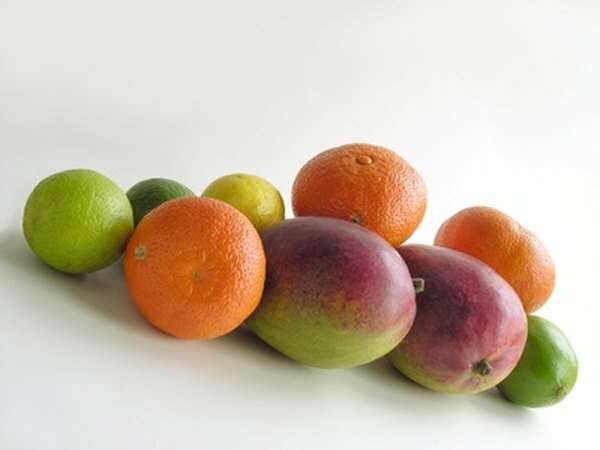 Fruits contain more sugar than vegetables. Try substituting fruit for added sugar in oatmeal, cereals and desserts. One serving of strawberries contains 8 grams of sugar, one serving of tangerine contains 9 grams of sugar, one serving of pineapple contains 10 grams of sugar and one serving of cantaloupe, grapefruit, honeydew melon or nectarine contains 11 grams of sugar, according to the FDA. Higher-sugar fruits include the peach, orange, pear, plum, cherry and banana, with 13 to 19 grams of sugar per serving, and the watermelon and grapes, with 20 grams of sugar per serving. Apples contain 25 grams of sugar per serving, according to the FDA. Lemons have only 2 grams of sugar per serving, and limes and avocados contain no sugar. The majority of your sugar intake should come from naturally sweetened foods such as fruits and vegetables. The American Heart Association recommends that women limit their intake of added sugars to no more than 100 calories per day, or about 6 teaspoons of sugar. To find out if a packaged food contains added sugars, check the ingredients label. Ingredients such as dextrose, fructose, glucose, corn syrup, high-fructose corn syrup, maltose, lactose, fruit juice concentrates, malt syrup, molasses, honey, sucrose and sugar all indicate added sugars. Fruits and vegetables provide many nutrients, including potassium, dietary fiber, folate and vitamins A, E and C. Maintaining a healthy diet rich in fruits and vegetables reduces your risk of stroke, cardiovascular disease, type 2 diabetes and some cancers, including colon, stomach and mouth cancer. Consuming plenty of potassium-rich foods, such as fruits and vegetables, may reduce your risk of kidney stones and may help prevent bone loss. Low-calorie, high-fiber foods, such as vegetables, can help you stay full for longer, helping you control your weight and caloric intake. USDA: What are Added Sugars?